Throughout New Zealand's central North Island there are numerous rivers with vehicle access. Walk and wade options provide superb Fly Fishing on nymph and dry fly. You can expect uncrowded waters, superb sight fishing, peace and tranquillity. Ken will pick you up at your accommodation in Turangi and head off through magnificent scenic country that forms the central North Island volcanic plateau. Nearly all of the central North Island rivers and streams hold good numbers of wild rainbow and brown trout, with numerous on-and-off road access points providing you with a wide choice from small freestone streams, crystal clear bubbling brooks on spring creeks, to large rivers such as the famous Wanganui, Whakapapa and Tongariro These flow from New Zealands central plateau providing fisher folk with stunning scenery and excellent trout fishing in an unspoiled, natural environment. 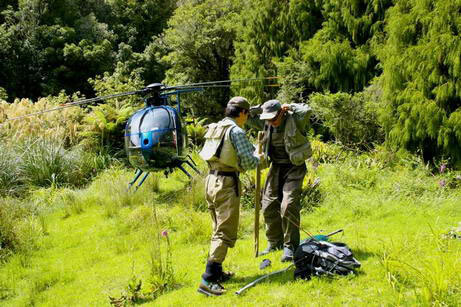 Ken has access through private farm lands, providing his clients with an off-the-beaten-track Fly Fishing experience in peace and solitude among New Zealand's pastoral lands and back country rivers and streams. This unique dry fly and nymph fishing is suitable for all anglers from beginners to seasoned experts. Lake fishing in New Zealand offers you the chance to catch a trophy fish. While there are many lakes to choose from Lake Otamangakau is a true world-class trophy lake. The Otamangakau Wetlands Conservation Area was formed in the 1960s as part of a major hydro system and has an enviable reputation for spectacular trophy fish often reaching double figures. "Lake O" or "The Big O", as it is known by the locals is often described as difficult to fish, and this is mainly due to the ever-changing terrestrial insects on which these monsters feed. Its open season is from the 1st of October to the 30th of May. Ken Drummond is one of the few professional guides to have mastered the secrets of this very special lake and its even more unusual inhabitants. Who cruise the banks and weed beds leaving big wakes. This is not fishing for the faint hearted: the fish of "Lake O" take no prisoners. Copyright © 2008 - 2019 Ken Drummond. All rights reserved.